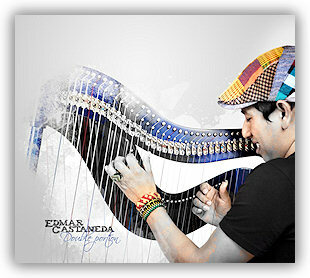 Lets get right down to it: harpist Edmar Castaneda’s Double Portion is an early contender for record of the year. If your only experiences with the harp are undulating and shimmering glissandos in movie soundtracks or perhaps hearing a harpist at a wedding playing transcriptions of Bach, then Castaneda’s playing will more than likely come as a revelation. Double Portion opens up a whole new world of the harp’s possibilities. Dorothy Ashby’s music is hip, and she did some great things in both more straight ahead and soul jazz veins. Alice Coltrane was certainly an innovative force on the instrument and produced several classic free jazz performances. On Double Portion Castaneda is in a completely different bag than Ashby and Coltrane, and brings a level of creativity and virtuosity that is on par, if not exceeding his harp predecessors. Whereas Coltrane often favored idiomatic glissandos to create waves of sound, Castaneda takes an approach that almost sounds guitar-like. In fact his harp, especially the Colombian harp, often sounds like a large guitar, which is very apparent on the five solo cuts. To see where Castaneda is coming from and to get his approach directly from the source, watch the EPK video below, where he describes how his music is a mixture between Colombia and New York and how he uses the harp in a new way: namely by playing the bass and the melody at the same time. Castaneda wrote nine of the album’s ten compositions – the only cover being Astor Piazolla’s “Libertango,” which features Hamilton de Holanda on mandolina. Joining Castaneda on two tracks is pianist Gonzalo Rubalcaba (who has also recently released an excellent solo album). Rubalcaba and Castaneda double the melody of the title track, which opens the album, creating timbres rarely heard. Castaneda supports Rubalcaba’s solo with strong bass lines, the resonance and sonic heft of which left me stunned upon first hearing them. The interplay between both musicians is excellent, and the line between soloist and accompanist is often blurred, if not erased altogether. The other Castaneda/Rubalcaba duet, “Quitapesares,” is also excellent, and contains several different rhythmic feels and grooves. The final flourish is quite impressive, with both men repeating developing short, punctuated statements that grow in energy, intensity and volume. MacArthur Genius award winning alto saxophonist Miguel Zenon is also a guest, and his collaboration with Castaneda on “A la Tierra” is one of the album’s high points. Here Castaneda plays bass lines while his other hand intertwines with Zenon, who is his usual impassioned and inspired self. After Zenon finishes his solo Castaneda plays an angular bass line and predominantly single note melody lines – which is a nice contrast to the thicker textures earlier in the tune. Zenon enters, accompanying Castaneda, who ratchets up the tension with tight and percussive notes and chords that increase in intensity and agitation before resolving, concluding the piece with a brief, but calm and ethereal coda. Double Portion is a blend of musical styles, of cultures, and is a thoroughly original, ingenious and moving album that will leave you simultaneously bopping your head in time and shaking it in amazement. If any of the above piques your interest in checking out Castaneda’s Double Portion, then do yourself a favor and buy the album, and listen to it again, and again, and again. Sounds great. Download only? CD used to be at least a minimum. I vote for high resolution downloads for this album!